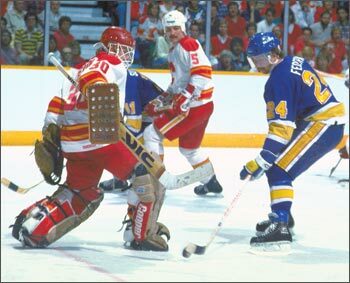 Bernie Federko's brilliant career will always be identified with the fate of the St. Louis Blues during the latter half of the 1970's and through the 1980's. During his thirteen seasons as a member of the Blues, Bernie was a firsthand observer of the peculiar rollercoaster rode that traced the fortunes of the St. Louis franchise. Coaches came and went. The franchise teetered on the brink of bankruptcy during the 1976-77 season, a campaign that forced the Blues to carve their staff to three employees. In 1977, Ralston Purina was convinced to invest in the team. But the Blues endured an ownership crisis again in 1983 when the pet food corporation attempted to sell the team to a group in Saskatoon, after losing almost $2 million. But the NHL blocked the sale, so Ralston Purina walked away, leaving the hockey team to be run by the NHL until new owners could be found. As a result, the St. Louis Blues did not participate in the 1983 NHL Entry Draft. Harry Ornest purchased the team and under new management, was able to reverse the team's fortunes. One of the elements that allowed the team to turn itself around was the talent that emerged from prudent drafting during the 1970's. In 1976, for example, the team selected Bernie Federko, Brian Sutter and Mike Liut, all of whom would develop into cornerstones of the franchise. "I played my first game in the old Arena on a Saturday night in February after we played two nights earlier in Boston," begins Federko. "I came back to play the first game in St. Louis and the atmosphere was so exciting in that old building. We were playing Buffalo and my line went head-to-head with the French Connection that night. I ended up scoring a hat-trick, including the game winner late in the third. We won 6-5. I'll never forget the energy and the noise of the crowd. It was one of those experiences you never, ever forget." Bernie and the Blues helped the team make a charge for the Stanley Cup in 1986. The team wasn't expected to make the playoffs, but not only entered the post-season, they climbed to the third round, the Conference Final. "In 1986, we came back to beat Calgary in Game 6 of the semi-finals. I'll never forget," beams Federko. "We were down three goals late in the third and ended up tying it up and winning in overtime." Game 6 took place on a Monday night, and has been tagged the 'Monday Night Miracle.' The Blues, down three games to two in the Conference Final, were 5-1 at home with twelve minutes remaining in the third period. But they rallied to tie the game at five by the end of regulation on the strength of a goal by Brian Sutter and a pair from Greg Paslawski. In overtime, Doug Wickenheiser scored to win the game, assisted by Bernie Federko on his thirtieth birthday. "The noise in the old arena was unbelievable!" The win forced a decisive Game 7 in the Western Conference Final, but the Flames edged St. Louis 2-1 to extinguish the Blues' dreams. Teammates Bernie Federko and Doug Gilmour both finished the post-season with 21 points, the first time players who had not participated in the Stanley Cup final had won the playoff scoring race. Although never fortunate enough to win the Stanley Cup, Bernie experienced both personal and team triumphs that he regards the pinnacles of his hockey career. "It's always a pleasure to be able to play in what we consider the greatest game. Every time I stepped on the ice, it was a special moment." Kevin Shea is the Hockey Hall of Fame's Editor of Publications and Online Features.